Pouya Tebyanian is one of the hundreds of unknown prisoners of conscience in Iran. On the morning of December 15, 2008, agents of the Intelligence Ministry in Semnan raided the homes of 21 Baha’is in a coordinated operation and confiscated their books, religious images, computers and mobile phones. On that day, only Sahba Rezvani, a Baha’i woman, was arrested. She was released after serving three years at Evin Prison. The other 20 Baha’is whose homes were searched were later summoned to the Revolutionary Court, tried, and received various sentences. Tebyanian was the only one among them who was arrested before his trial. Intelligence Ministry agents arrested Tebyanian on March 8, 2009 at his workplace. After two months of solitary confinement and interrogations at the Intelligence Ministry’s detention center, he was transferred to Semnan’s central prison. The Revolutionary Court of Semnan tried Tebyanian on charges of proselytizing and of membership to a Baha’i organization, and he was sentenced to two years and six months in prison. The Appeals Court reduced his sentence to two years. His defense attorney at the trial was human rights lawyer Abdolfattah Soltani, who was also the spokesman for the Defenders of Human Rights Center. Suspecting that he would be arrested, Tebyanian had talked to Soltani before his arrest, and Soltani had agreed to represent him if he were to be detained. After his arrest, Tebyanian mother informed Soltani, who repeatedly traveled to Semnan to attend to the case without receiving any compensation or fee. At the time of his arrest, Tebyanian was 23 years old and, like many other young Baha’is in Iran, was banned from higher education. But he loved his country and preferred to stay in Iran and not emigrate. When he was exempted from compulsory military service due to his very low weight, he began studying chemistry at the underground Baha’i Institute for Higher Education (BIHE) and, at the same time, he worked as an accountant at an optician’s shop. In 2008, many anti-Baha’i gatherings and seminars were held in Semnan to prepare the ground for the harassment of the Baha’is and the raiding of their homes. This harassment continues today, though in the last two years it has been less intense. But during that period, the pressures were so great that in the summer of 2012 the Baha’i International Community issued a statement entitled “Semnan Baha’is: A Community Under Fire,” and appealed to the world community to persuade the Islamic Republic to stop its harassment of Baha’i citizens in Semnan. Between 2008 and 2016, Baha’is in Semnan were harassed and threatened extensively by the government’s official and unofficial agents and by rogue vigilantes. Dozens of Baha’is were arrested and imprisoned, including three Baha’i mothers with infant babies. A number of Baha’is were exiled to distant locations. Many Baha’i businesses were shut down and the people of Semnan were told not to have any business dealings with the Baha’is. Baha’is were practically forbidden to conduct business in Semnan and many of them were forced to migrate in order to make a living. In May 2012, intelligence agents raided and closed two factories in Semnan under full or partial Baha’i ownership. One factory manufactured vertical blinds and employed 51 staff — 36 of them were not Baha’is. The other, a lens-grinding factory, had two Baha’i and six non-Baha’i employees. The list of harassments and injustices that the Baha’is in Semnan have suffered over the last decade is long. Their graveyards were destroyed; Intelligence Ministry agents arrested young Baha’i men who had reached the age for compulsory military service and handed them over to the police; windows of Baha’i homes and the windshields of cars were broken; stones and incendiary objects were thrown into Baha’i homes and places of business at night; obscenities were painted on the walls and the doors of Baha’i homes and businesses; clergymen went to schools and insulted the Baha’i faith in the presence of Baha’i children. On May 9, 2010, Tebyanian was released on parole after 14 months in prison. 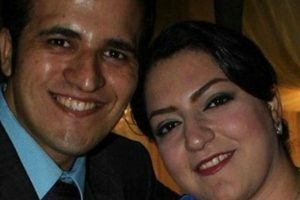 The remaining 10 months of his sentence was changed to two years of a suspended prison sentence, but he was arrested for a second time on March 12, 2011, when agents of the Intelligence Ministry again raided the homes of the Baha’is in Semnan. Others arrested at their homes during this raid included: Zohreh Nikaeen, Taraneh Torabi, Elham Rouzbehi, Nader Kasanei and Zhinoos Nourani. On April 3, 2011, Tebyanian was released on a bail of 100 million tomans, close to US$25,000. On June 11, however, he was arrested for a third time. The reason given for his third arrest was that his suspended sentence had been reinstated, but after 11 days it was said that a mistake had been made and he was released. On December 22, 2012, Tebyanian presented himself at Semnan’s central prison to start serving his two years and six month prison sentence. At Semnan prison, like most other prisons in Iran, Baha’i inmates were kept in separate cells away from other prisoners. When Tebyanian was incarcerated there were many Baha’is in Semnan prison, but gradually their numbers dwindled as they were released after serving their sentences in full. 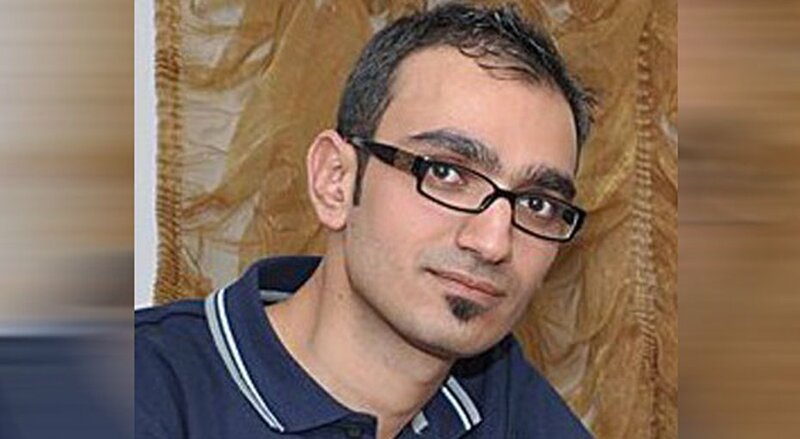 The last Baha’i prisoner besides Tebyanian was Afshin Ighani, who was released in January 2016, after serving his full sentence of four years and three months. Now Tebyanian is the only remaining Baha’i at Semnan Prison. But after more than 2,000 days, Tebyanian is no longer just another prisoner of conscience. He has become a person of trust among the inmates and spends his days listening to the problems of the prisoners and, if possible, helps them to solve their problems. He has become known as the “ward’s lawyer” and handles other prisoners’ correspondence, be it personal or related to their cases and conditions. His only entertainment consists of planting flowers and the weekly meetings with his family from behind a glass partition. Pouya Tebyanian n’est que l’un des centaines de prisonniers de consciences anonymes d’Iran. Le 15 décembre 2018 au matin, des fonctionnaires du Ministère de la sécurité (Intelligence Ministry) de Semnan lancèrent une opération coordonnée et firent une descente chez 21 baha’is, confisquèrent leurs livres, leurs images religieuses, leurs ordinateurs et leurs téléphones mobiles. Ce jour-là, seule une baha’ie, Sahba Rezvani, fut arrêtée. Elle fut libérée après avoir passé trois ans à la prison Evin. Les 20 autres baha’is dont les maisons avaient été fouillées passèrent plus tard devant le tribunal révolutionnaire, furent jugés et condamnés à diverses sentences. Tebyanian fut le seul à être arrêté avant son procès. Les fonctionnaires du Ministère de la sécurité arrêtèrent Tebyanian à son travail le 8 mars 2009. Après deux mois d’interrogations et d’isolement au centre de détention du Ministère de la sécurité, il fut transféré à la prison centrale de Semnan. Tebyanian fut accusé par le tribunal révolutionnaire de Semnan de prosélytisme et d’appartenance à une organisation baha’ie ; il fut condamné à deux ans et demi de prison. La cour d’appel réduisit la peine à deux ans. Au tribunal, son avocat était Abdolfattah Soltani, défenseurs des droits de l’Homme et porte-parole du Centre de défense des droits de l’Homme. Sentant qu’il allait être arrêté, Tebyanian lui avait demandé de le représenter et Soltani avait accepté s’il était arrêté. La mère de Tebyanian informa Soltani de l’arrestation de son fils et l’avocat fit régulièrement le voyage jusqu’à Semnan pendant le procès sans émoluments ni compensation pour ses frais. 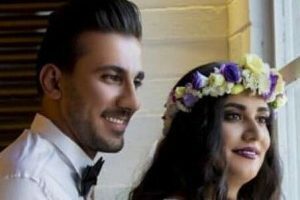 Tebyanian avait 23 ans lorsqu’il fut arrêté et comme beaucoup d’autres jeunes baha’is iraniens il avait été interdit d’études supérieures. Mais, aimant son pays il préféra rester en Iran plutôt que d’émigrer. Exempté de service militaire obligatoire à cause de sa maigreur, il commença des études de chimie à l’institut clandestin d’études supérieures organisé par les baha’is (BIHE) tout en travaillant comme comptable chez un opticien. En 2008, de nombreuses réunions et des séminaires anti-baha’is furent organisés à Semnan, en préparation d’une période d’harcèlement des baha’is et de rafles dans leurs maisons. Cette période n’est toujours pas terminée même si, ces deux dernières années, elle a diminué d’intensité. Mais l’été 2012 les pressions furent si intenses que la Communauté internationale baha’ie publia un communiqué intitulé : « Les baha’is de Semnan : une communauté éreintée » et en appela à la communauté internationale pour convaincre la république islamique de cesser son harcèlement des citoyens baha’is de Semnan. Entre 2008 et 2016, le harcèlement et les menaces venant des fonctionnaires du gouvernement, d’agents non-officiels et de bandes de voyous, ne cessèrent pas Des douzaines de baha’is furent arrêtés et emprisonnés, notamment trois jeunes mères et leurs bébés. Plusieurs baha’is furent exilés au loin. Beaucoup d’entreprises appartenant à des baha’is furent fermées et la population de Semnan fut prévenue de n’avoir rien à faire avec les baha’is. Pratiquement, les baha’is furent interdits d’entreprendre quoi que ce soit à Semnan et beaucoup d’entre eux furent forcés d’émigrer afin de pouvoir gagner leur vie. En mai 2012, des fonctionnaires de la sécurité firent une descente dans deux usines de Semnan, propriétés en tout ou en partie de baha’is et les fermèrent. L’une de ces entreprise, fabricant des stores, employait 51 personnes (dont 36 n’étaient pas baha’is) et l’autre, polissant des lentilles d’instruments d’optique, employait deux baha’is et six non-baha’is. Lorsque Susan Tebyanian, baha’ie de Semnan, révéla la pression économique que subissaient les baha’is de cette ville dans un interview par un média étranger, elle fut condamnée à un an de prison pour « propagande contre le régime ». Le 9 mai 2010, Tebyanian fut libéré sur parole après 14 mois de prison. Les 10 mois restants de sa sentence furent commués en deux ans de prison avec sursis. Pourtant il fut arrêté de nouveau le 12 mars 2011 au cours d’un nouveau raid des fonctionnaires du Ministère de la Sécurité contre les maisons des baha’is de Semnan. Arrêtés aussi furent Zohreh Nikaeen, Taraneh Torabi, Elham Rouzbehi, Nader Kasanei et Zhinoos Nourani. Le 3 avril 2011, Tebyanian fut libéré sous caution de 100 millions de tomans (près de 25000 dollars US) pour être arrêté une troisième fois le 11 juin parce que, soi-disant, son sursis avait été annulé. Après 11 jours on lui dit que c’était une erreur et il fut libéré. Pourtant, le 12 juin 2017, Tebyanian fut jugé une deuxième fois. Le juge Mohammad Ghassem Einolkamali suspecté de violations de droits de l’Homme, le condamna à un an de prison pour « propagande contre le régime » et à cinq ans et demi de prison pour « crimes contre la sécurité nationale ». Ces condamnations sont basées sur deux articles du Code pénal islamique : l’Article 500 qui stipule que « quiconque s’engage dans tout type de propagande contre la République islamique d’Iran ou en soutien de groupes ou d’associations d’opposition, sera condamné à un emprisonnement de trois mois à un an », et l’article 498 qui ordonne : « Quiconque, quelle que soit son idéologie, établit ou dirige un groupe, une association ou une branche, à l’intérieur ou à l’extérieur du pays, quelque soit son titre ou son nom, composé de plus de deux personnes et dont le but est de perturbé la sécurité du pays, sera condamné, s’il n’est pas considéré mohareb [guerrier contre Dieu], à un emprisonnement de deux à dix ans. » Le 22 décembre 2012, Tebyanian se présenta à la prison centrale de Semnan pour commencer à subir sa condamnation de deux ans et six mois. 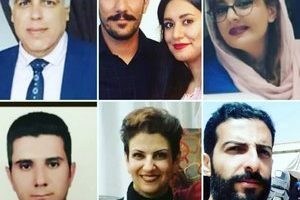 Comme dans la plupart des prisons d’Iran, à Semnan les condamnés baha’is sont séparés des autres prisonniers. Quand Tebyanian fut emprisonné, beaucoup d’autres baha’is de Semnan l’étaient aussi mais peu à peu, leur condamnation accomplie, leur nombre diminua et le dernier prisonnier baha’i relâché fut Afshin Ighani qui en janvier 2016 avait accompli la totalité de sa condamnation de quatre ans et trois mois. Aujourd’hui, Tebyanian est le seul prisonnier baha’i de la prison de Semnan. Mais après plus de 2000 journées de prison Tebyanian n’est plus simplement qu’un prisonnier de conscience de plus. Il est quelqu’un en qui les détenus ont confiance et il passe ses jours à écouter leurs problèmes et, si possible, à les aider à les résoudre. On l’appelle « l’avocat du bloc » et s’occupe de la correspondance des détenus, qu’elle soit personnelle ou en rapport avec leur situation ou leur dossier. Sa seule distraction consiste à planter des fleurs et à rencontrer sa famille, derrière une vitre, une fois par semaine.